Our concept was to re-imagine this exquisite vintage masterpiece within the frame of the current Ref. 214270 Explorer. As you can see, every effort has been made to stay faithful to the key characteristics of the Ref. 6350; the hand-engraved guilloche gilt dial, the gilt pencil hands as well as the reprofiled factory Oyster band to straight end link format. All elements come together to revive a glorious moment of true heritage watch passion! The EXP-01's dial is fastidiously produced entirely by hand. The 'honeycomb' texture is engraved using a manual engraving machine, taking nearly 6 hours of intense concentration to achieve the correct depth and width of lines. Then the luminous plots are etched, in the same fashion as the original Ref. 6350 which had sunken troughs that were then filled with luminous compound. Following this, the negative relief gilt text is galvanically created to the same specification that Rolex employed throughout the 1950's; a secret technique coveted by our in-house dial master. A thin film of Zapon lacquer is applied to create the finish and embellish this true masterpice of watch dial creation. 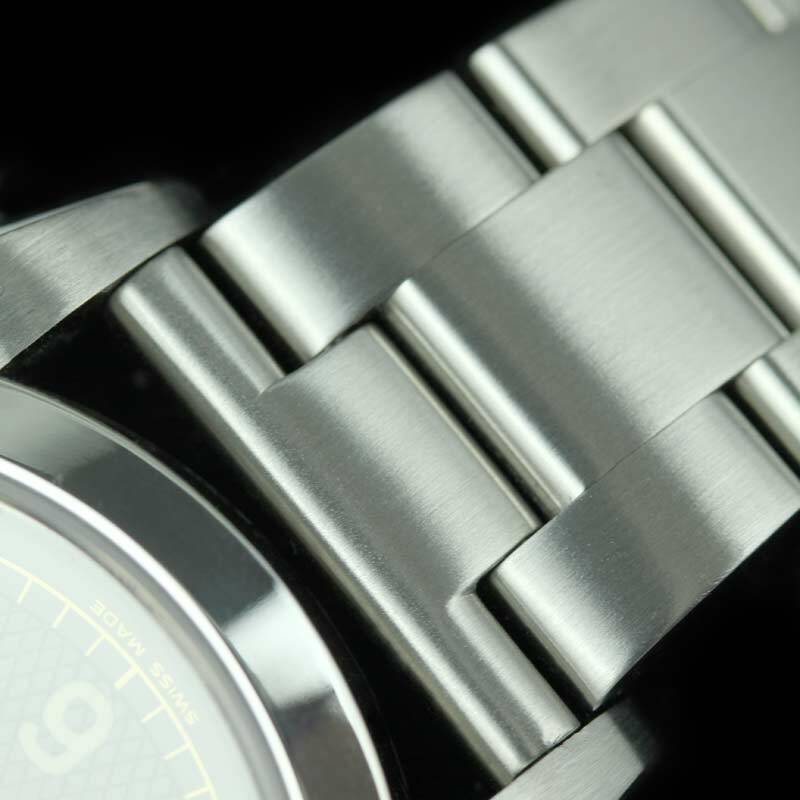 There is something uniquely elegant about the straight end link Oyster band: it is a 'no nonsense', simple and structured design that requires little or no maintenance. It first appeared on the bubbleback models of the early 1950's as an Oyster rivet and in a beaded format as well. 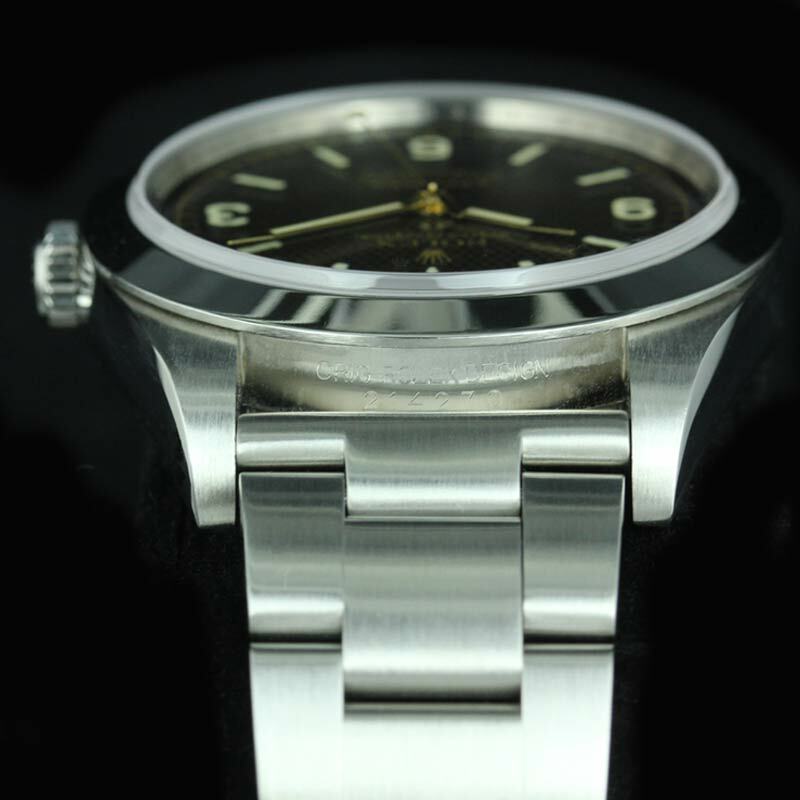 We offer our EXP-01 on the factory Rolex Oyster bracelet that we have modified and reprofiled to create a straight end link version. In this way you will benefit from the faultless design and hardiness of the current factory band, but enjoy the simple style of its vinatge forefather. We are also offering a specially designed leather 'Bund' style strap in one of 3 colours as part of the package, giving you ultimate choice in style and comfort. Please see the GALLERY page for more detailed pictures. Found on the original Ref. 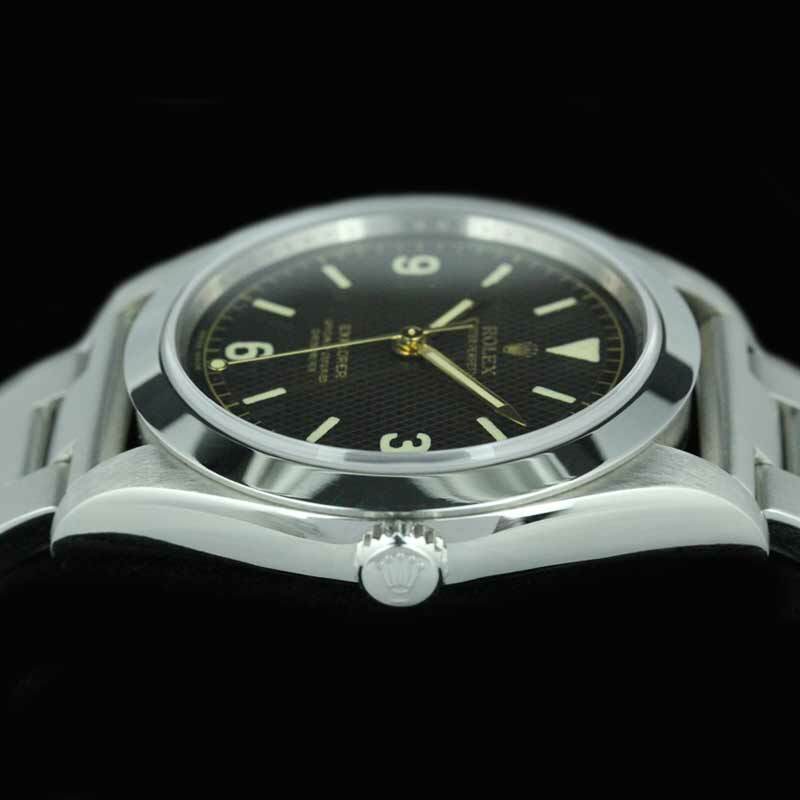 6350 Explorer, the 6204 Submariner and rarely on the Ref. 6202 Turnograph, the pencil hands with bubble-tipped seconds strike a very formidable pose on top of the dial face. This style was originally developed and seen on many military watches throughout the 1940's mainly for their simplicity and 'readability'. No expense nor hardship has been spared to bring these incredible hands back to life on the EXP-01. They have been custom made in Switzerland uniquely for us and you will not see them on any other watch in the world. The hands are filled (to match the dial) using Superluminova and the daylight colour can be tinted to any tone you wish. Night time colours are green or blue. Staying true to the original Ref. 6350, the EXP-01 retains a smooth stainless steel bezel maintained from the Explorer 1 base watch, but we have slightly reprofiled the top angle to make it sit flatter to the case top. In this fashion, it makes a more complimentary partnership with the modern flat Rolex crystal. By remaining faithful to the slender simplicity of the Ref. 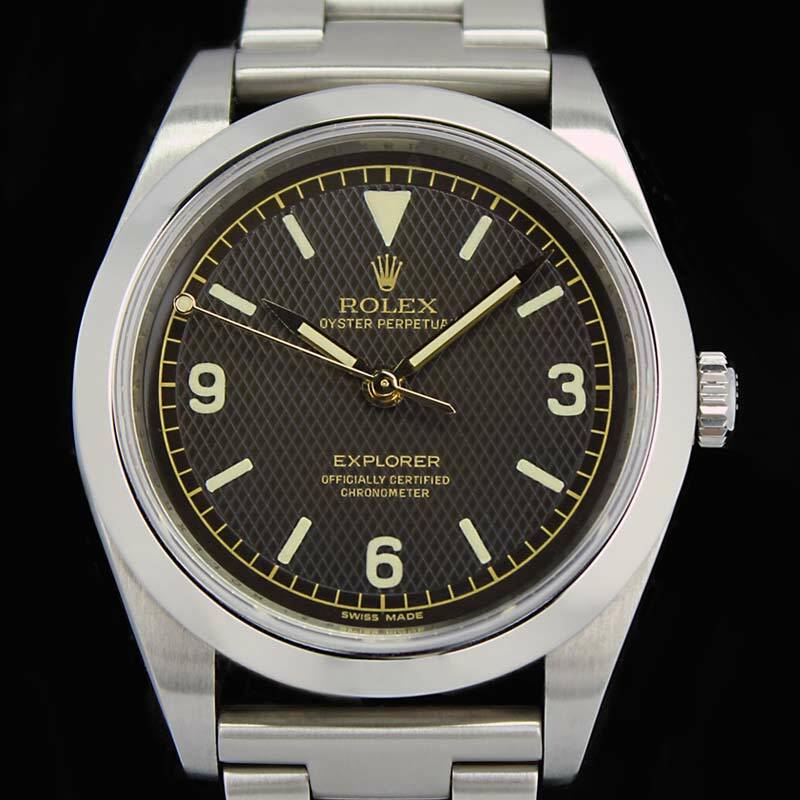 6350, we hope to have achieved as close as possible in modern terms, what this awesome watch would look like if it were reintroduced by Rolex today. Acknowledging the current trend for modern sports watch cases to be chunkier and more ‘substantial’, we have used the new 39mm Explorer Ref. 214270 as our base watch for this heritage piece. This creates a timepiece that is slightly larger than the original Commando Ref. 6429 which had a 34mm case and 19mm lug width yet is 'discreet’ and comforatble to wear, highly readable yet not too big so as to catch on other equipment. 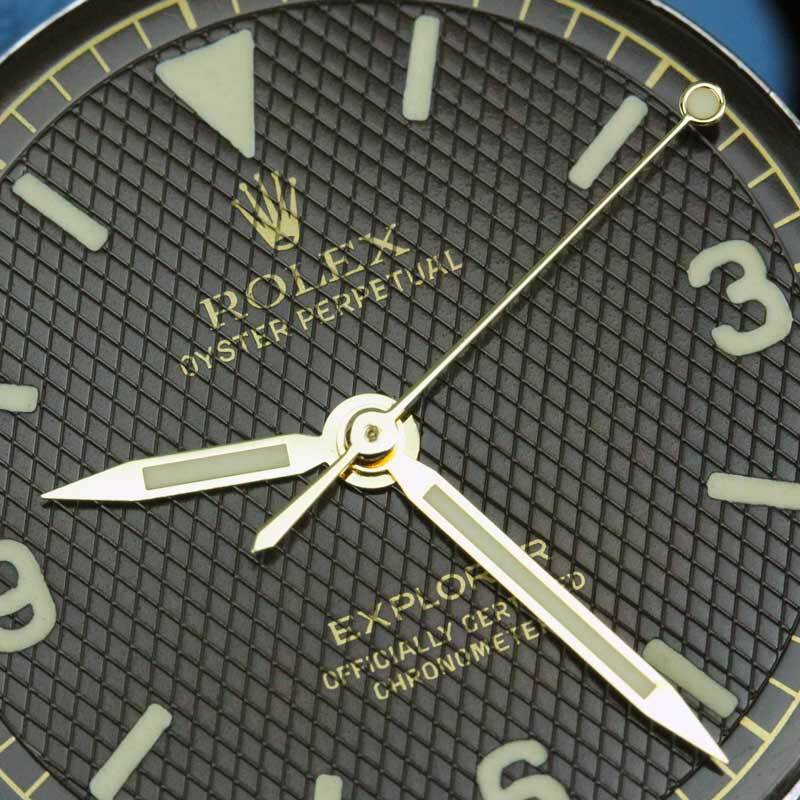 Modern sports Rolex cases have evolved over the years, with a trend towards a ‘bigger and bolder’ frame and while there is little practical reason for this we believe that delicately redefining the case gives a much more elegant and comfortable wearing timepiece. In addition each case is engraved on the caseback with 'COMMANDO' along with its model number and a unique issue number out of 33, in this edition. 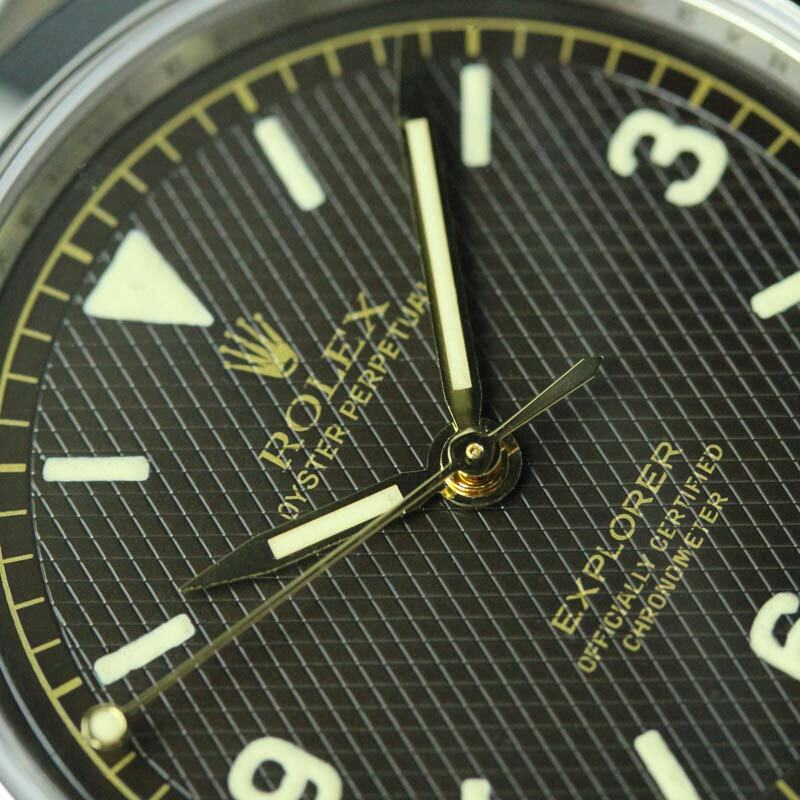 Following this, the negative relief gilt text is galvanically created to the same specification that Rolex employed throughout the 1950's; a secret technique coveted by our in-house dial master. A thin film of Zapon lacquer is applied to create the finish and embellish this true masterpice of watch dial creation. The fusion of these features speaks so much about the heritage of this exquisite watch. No expense nor hardship has been spared to bring these incredible hands back to life on the EXP-01. They have been custom made in Switzerland uniquely for us and you will not see them on any other watch in the world. The hands are filled (to macth the dial) using Superluminova and the daylight colour can be tinted to any tone you wish. Night time colours are green or blue. Acknowledging the current trend for modern sports watch cases to be chunkier and more ‘substantial’, we have used the new 39mm Explorer Ref. 214270 as our base watch for this heritage piece. This creates a timepiece that is slightly larger than the original EXPLORER Ref. 6350 which had a 36mm case, yet is 'discreet’ and comforatble to wear, highly readable yet not too big so as to catch on other equipment. Modern sports Rolex cases have evolved over the years, with a trend towards a ‘bigger and bolder’ frame and while there is little practical reason for this we believe that delicately redefining the case gives a much more elegant and comfortable wearing timepiece. In addition each case is engraved on the caseback with its model number and a unique issue number out of 33, in this edition. It may be worth noting that for an additional works fee, the spring bar holes in the lugs can be drilled through to add a further vintage accent to this heritage timepiece.